Includes recent concerns about the prevalence of bullying, new legal requirements to provide training to prevent abusive conduct and the need to clarify legal definitions of harassment. With recent concerns about the prevalence of bullying, new legal requirements to provide training to prevent abusive conduct (for example, the AB 2053 CA mandate), and the need to clarify legal definitions of harassment, Lets Talk is the answer! This series addresses all of these issues and more in a concise, easy-to-understand way. 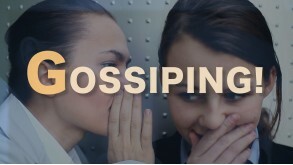 Engaging and informative, Lets Talk, which includes the complementary but stand-alone programs, is a great tool to understand and stop harassment and bullying, and encourage a respectful, productive workplace. Bullying, Abusive Conduct, and Their Consequences defines bullying and abusive conduct, their impact on people and organizations, and their remedies. An advantage of this program is its clarification of the legal definition of bullying, an aspect of the topic that many people are unsure of. It's a perfect add-on program to enhance harassment training legally required to include prevention of abusive conduct, for example the new AB 2053 CA mandate. Harassment - It Happens! 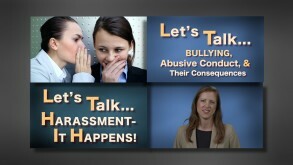 defines Harassment, its impact on people and organizations, and its remedies. An advantage of this program is its coverage of the legal definitions of both Quid Pro Quo Harassment (with an expanded definition that includes more than Sexual Harassment) and Hostile Work Environment Harassment. An excellent guide to addressing Harassment, the program both engages the viewer and covers a lot of ground including such legal concepts as Tangible Employment Action and Vicarious Employment Action Liability. Its a great tool to help achieve a happy, productive workplace. 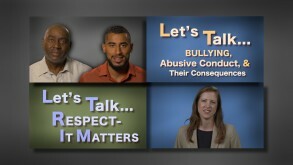 Respect It Matters, focuses on how professionalism contributes to a respectful workplaces. It can be difficult to define respect. The advantage of this program is the way that it equates respect in the workplace with professionalism, in an easy-to-understand way. 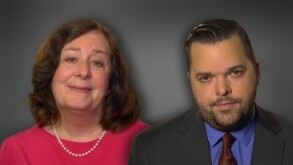 This 9-minute program, with its examples of appropriate, respectful behavior versus that which is unprofessional and unproductive, clearly shows the difference between commonly held standards of professionalism, organization policy, and the law. An excellent guide to respect and professionalism in the workplace, the program both engages the viewer and effectively educates. Its a great tool to help achieve a happy, productive, and legally compliant workplace. 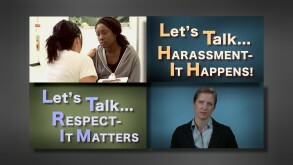 How do harassment,bullying & respect affect individuals and organizations?